PITTSBURGH (July 26, 2018) … Manufacturers use carbon nanotubes in a variety of commercial products from baseball bats and bicycle frames to aerospace structures. Attributes such as a tensile strength 20 times higher than steel and an electrical conductivity 10 times that of copper have caused the global carbon nanotube market to soar to $3.43 billion in 2016, and it is projected to double by 2022. To better understand and control the internal structure of nanotube-based materials for emerging applications, the National Science Foundation (NSF) awarded $330,000 to Mostafa Bedewy, assistant professor of industrial engineering at Pitt's Swanson School of Engineering. In this new NSF project titled "Functionally Graded Carbon Nanotubes by Dynamic Control of Morphology during Chemical Vapor Deposition," Dr. Bedewy will employ a combination of experimental and modeling techniques to reveal the kinetics of activation and deactivation in large populations of carbon nanotubes known as "nanotube forests." 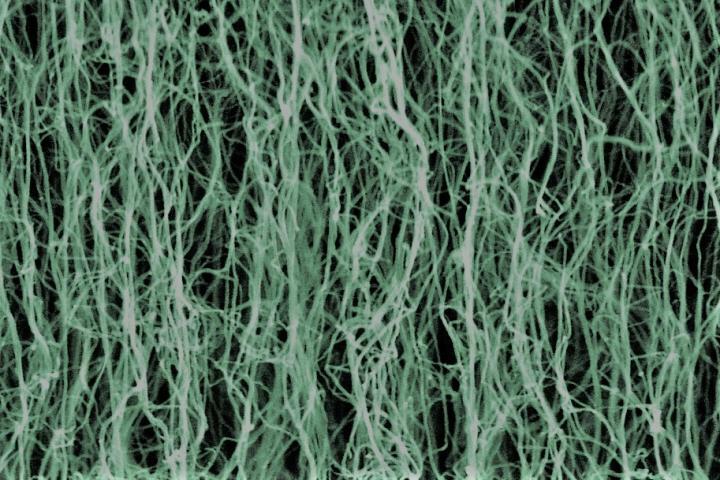 "In the community of carbon nanotube researchers, structures made of billions of vertically-aligned nanotubes are sometimes referred to as forests, turfs, arrays, or films, but I think the term "forest" best describes their complex intertwined and tortuous morphology," says Dr. Bedewy. "Research efforts abound on how the size and atomic structure dictate the properties of individual nanotubes, but in my lab we are more interested in looking at these nanotube forests collectively to gain a fundamental understanding of how they behave together as a population." Carbon nanotubes are hollow, cylindrical nanostructures consisting of single-sheets of carbon atoms. Their sizes are typically smaller than one ten-thousandth the width of a human hair. Random assortments of individual nanotubes appear in many technologies because of their desirable electrical, physical, and thermal properties; however, leveraging the exceptional collective mechanical, thermal and electrical properties of nanotube forests is very promising for applications that require directional energy and mass transport. Dr. Bedewy explains, "Our previous work has shown that when we grow nanotube forests by chemical vapor deposition, we end up with a significant variation of density, alignment, and size distribution across the height of each forest. These spatial variations directly impact their collective properties such as their behavior under mechanical loading." Chemical vapor deposition (CVD) is a process that enables the synthesis of carbon nanotubes from catalyst nanoparticles by the decomposition and dissociation of hydrocarbon gases. CVD is the process of choice for industrial applications of nanotubes owing to its scalability and versatility, as well as the high quality of CVD-grown nanotubes. "I am very excited about this NSF grant, because it will enable us to create nanotube "forests" with tailored morphology, leveraging the unique capabilities of our custom-designed rapid-thermal chemical vapor deposition (RT-CVD) reactor, which will enable unprecedented control of nanotube density profiles," says Dr. Bedewy. Emerging applications such as thermal interfaces for high power density devices, electrical interconnects for 3D electronics, and structural materials for mechanical energy absorption require greater control of the nanotube forest structures, and therefore, a better understanding is needed for how the forest morphology develops during the production process, i.e. during their collective growth by CVD. "Our work will shed light on the stochastic nature of how individual nanotubes "pop" into existence in a population of billions of neighboring nanotubes, whose growth is seeded from catalytically active nanoparticles. Revealing the interplay between the kinetics of this "birth" and "death" of nanotubes is key to understand their population behavior during growth, which dictates their overall hierarchical structure and collective properties," says Dr. Bedewy.